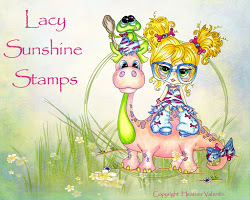 Faery Ink is a fantastic digital stamp art and web design company that produce gorgeous digital images perfect for cardmakers like me. 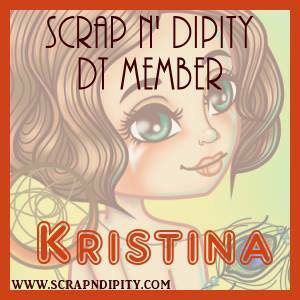 Faery Ink are having a DT call so I thought I would put myself into contention. Being on a Design Team is a great way to inspire others to reach their creative potential - I think that is why we all love sharing our work - the Craft community is amazing, supportive and friendly (in my experience anyway). It also helps others to get ideas of their own to use the products the Design Team are promoting, and also promote new release products. It is also great to be able to schedule in my crafting time - I know I have deadlines with my DT obligations and makes me so much more productive - sounds weird I know but I am someone who works so much better with deadlines than with a random - get it done whenever - lol. Being on Design Teams also help you to build your stash!! I sell some of my cards, use a lot for friends and family and all my colleagues at work get a hand made card every birthday and Christmas. I feel honoured to walk around the office and see the cards lovingly displayed on peoples desks all year!! 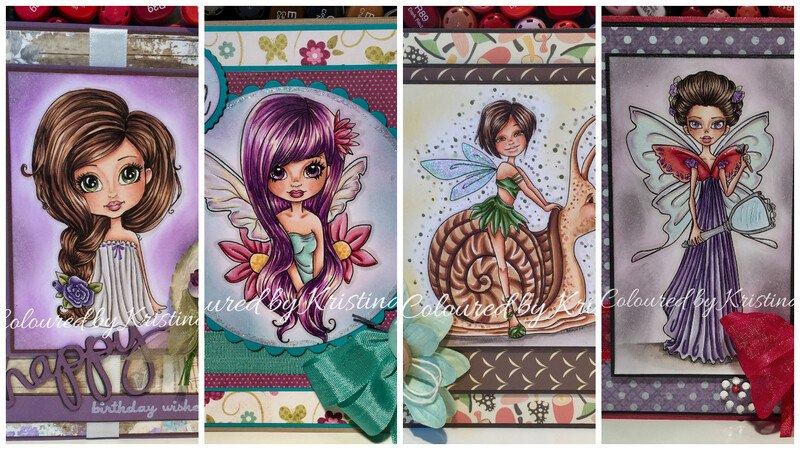 I discovered the beautiful images from Faery Ink about 6 months ago after Alyce over at Kit and Clowder used an image in her monthly Create and Learn from Faery Ink, and am slowly building up my image collection. They have a regular monthly freebie if you sign up to their newsletter which you can do through the blog or shop site - and even doing that will get you a free image - and lets face it - we all LOVE a freebie. Once I signed up for the newsletter and got my freebie, I have started to build up my collection of images - probably have about 20 now - and the collection keeps growing. 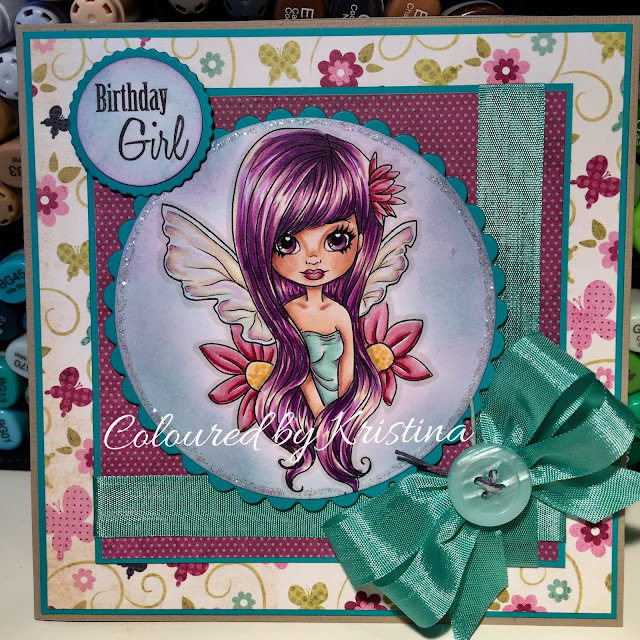 There are so many great images to choose from, but I think my favourite at the moment is the one I have used in my card below - Arielle Flora Fae. For this card I wanted to try out a different hair colour combination, so I used Copics - Y11, V04, V06 and V09. I love how the yellow marker gives it a real contrast. I also really played around with a stack of light colours for the wings and I really liked the effect. They are actually glittery in real life, but it is always hard to show in a photo. Faery Ink images are always so beautifully feminine and I have a real weakness for Fairies and Mermaids, so Faery Ink images are go to images. I am a card maker - rarely working on other types of projects - and Faery Ink images are perfect for cards. I like the colouring to be the hero of the card and the Faery Ink images always are breathtaking once coloured up and displayed front of centre. The crafting community is huge now and there are so many opportunities to participate and get feedback and inspiration. I have just started using Instagram to share my cards, and also use Pintrest - which is a great source of inspiration, Facebook and of course sharing my work on my blog. 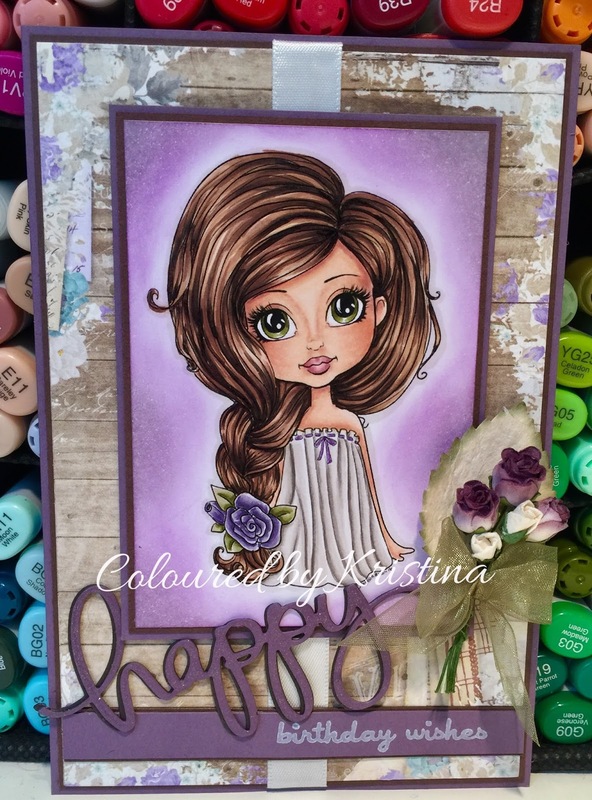 And once again I have turned to my purple colours for the next card using - Ophelia Vanity Fae. This time I thought I would use a bright contrasting colour and picked red. 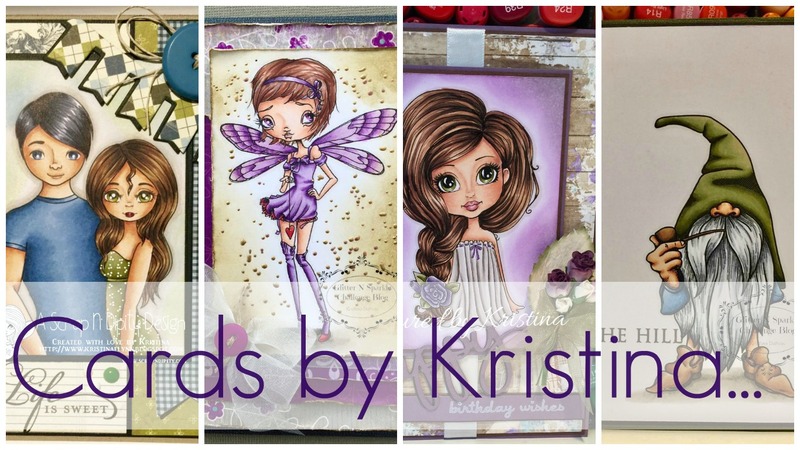 All my cards are coloured with Copic Markers - it is my go to colouring medium. My go to reds are - R22, R24, R27, R29, R39, and my go to purple combo is V20, V22, V25, V17, BV08. I also always print out my digi images quite large, making them the focus of the card. Opehlia's wings were a challenge and again they are sparkly in real life - I need to perfect my photo taking to show the sparkle! I am on a few design teams at the moment (Lacy Sunshine, Scrapper's Delights, and a couple of challenge blogs as well) and I absolutely love the team spirit and also being able to work with a whole range of images, sometimes ones that perhaps I would not have chosen myself, and this forces me to extend myself and become more creative in learning to colour an image I would have found challenging.And this was definitely the case with colouring in the Snickerdoodle and the Snail image. Never coloured a snail before and had to work out how to start. That's what PINTREST is great for - so many amazing images of snails to use for reference! 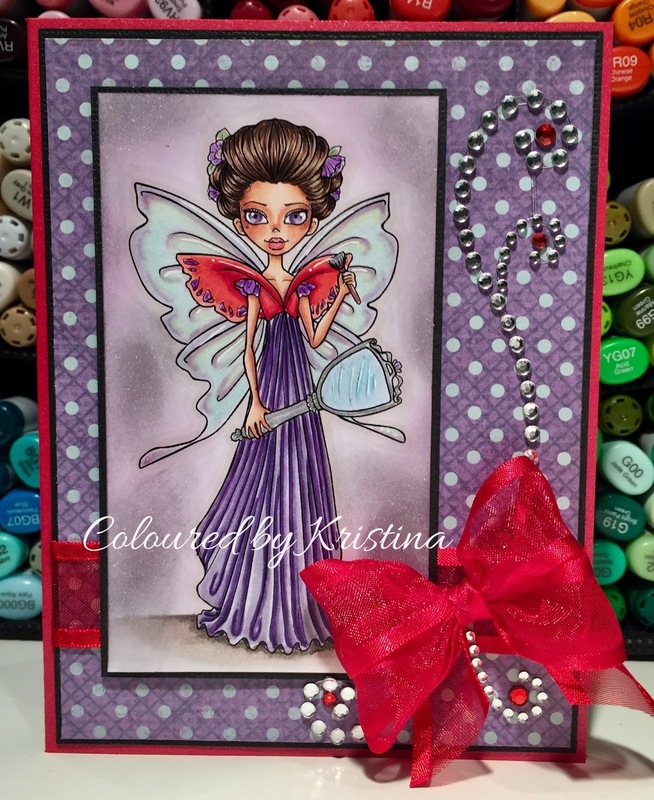 Colouring and card making is my hobby - I love it and love to share and hope that I can inspire others to be creative to. I teach card making classes at a small local papercrafting store where I live, and if I can just pass on one new technique or inspire one person through my love for all things cardmaking, then I have succeeded. I know there is always room for improvement and the more I colour and create the more I grow - it is my creative outlet and I am hoping more people can be caught up in the wonderful world of crafting. Thanks for looking and keep your fingers crossed for me. Have a great day and keep colouring! These are all so beautiful!! Gorgeous coloring too. Good luck with the DT call.